A consortium of nine companies has won the right to build a hydroelectric dam on a tributary of the Amazon in Brazil. Brazil's electricity regulator said the Norte Energia consortium would build the Belo Monte dam, to which indigenous groups and environmentalists object. It is led by the state-owned Companhia Hidro Eletrica do Sao Francisco. Officials say the dam on the Xingu River is crucial for development, but critics argue thousands of people will be displaced and an ecosystem damaged. The bidding had been halted three times before a final appeal by the government allowed the winning bidder to be announced. About 500 people gathered on Tuesday outside the offices of the Brazilian Electricity Regulatory Agency (Aneel) in the capital, Brasilia, to protest against the auction. About 80% of the energy in Brazil comes from hydroelectric dams and the government is serious about building new ones. The state-owned Energy Research Company estimates that only a third of the hydroelectric potential of the country has been tapped into. And most of the remaining sites lie in the Amazon basin. Hydroelectric power is often praised as renewable and low-emission, but it often causes disruption to nature and people. Environmentalists say Brazil should be looking into increasing the efficiency of current power plants and using alternative energy sources, such as wind and solar, instead of building dams. But the government says that it has to produce a lot of energy to feed a booming economy and that burning oil, gas or coal in conventional power plants would be the only other viable option. With the Belo Monte dam and other similar projects moving forward, the debate over where development conflicts with conservation is likely to grow just as aggressively. The environmentalist group, Greenpeace, dumped several tonnes of manure at the door to demonstrate what it said was "the legacy that the Lula government is leaving by insisting on this project". But after a last-minute injunction was lifted, Aneel announced that Norte Energia had won the rights to develop the Belo Monte dam with an offer of 77.97 reals ($57.12) per megawatt produced. There was only one other competitor - the Belo Monte consortium. Earlier this month, two of Brazil's biggest construction companies walked away from the bidding process, saying the financial returns were too low. The government had set a maximum price of 83 reals per megawatt. The proposal to build a hydro-electric dam on the Xingu river, a tributary of the Amazon in the northern state of Para, has long been a source of controversy. The initial project was abandoned in the 1990s amid widespread protests both in Brazil and around the world. Environmental groups say the Belo Monte dam will threaten the survival of indigenous groups, and the lives of up to 40,000 people could be affected as 500 sq km of land would be flooded. 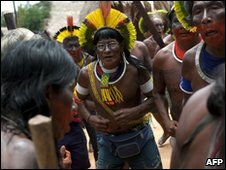 Luis Xipaya, an indigenous leader in the city of Altamira, near the proposed dam, said 150 Xikrin Kayapo Indians would move to the construction site by Wednesday. "There will be bloodshed and the government will be responsible for that," he told the Reuters news agency. The government has dismissed the criticism and promised the winning consortium would pay $800m to protect the environment. The 11,000 MW dam would be third largest in the world, after the Three Gorges in China and Itaipu, which is jointly run by Brazil and Paraguay. It is expected to provide electricity to 23 million homes. With Brazil's economy continuing to show signs of growth, ministers say hydro-electric plants are a vital way to ensure power supplies over the next decade - and at least 70 dams are said to be planned for the Amazon region. Critics say the Belo Monte plant will be hugely inefficient, generating less than 10% of its capacity during the three to four months of the year when water levels are low.